Currently, much of the mountain range is protected by public parks and forest lands, and is a popular tourist destination, especially for hiking, camping, mountaineering, fishing, hunting, mountain biking, skiing, and snowboarding. The name of the mountains is a translation of an Amerindian name that is closely related to Algonquian; the Cree name "as-sin-wati", given as, when seen from across the prairies, they looked like a rocky mass. The first mention of their present name by a European was in the journal of Jacques Legardeur de Saint-Pierre in 1752, where they were called "Montagnes de Roche". The Rocky Mountains are commonly defined as stretching from the McGregor Plateau, resembles the Rockies but is considered part of the Interior Plateau. The eastern edge of the Rockies rises dramatically above the Interior Plains of central North America, including the Sangre de Cristo Mountains of New Mexico, the Front Range of Colorado, the Wind River Range and Big Horn Mountains of Wyoming, the Absaroka-Beartooth ranges and Rocky Mountain Front of Montana and the Clark Range of Alberta. In Canada geographers define three main groups of ranges: the Continental Ranges, Hart Ranges and Muskwa Ranges (the latter two flank the Peace River, the only river to pierce the Rockies, and are collectively referred to as the Northern Rockies). The Muskwa and Hart Ranges together comprise what is known as the Northern Rockies (the Mackenzie Mountains north of the Liard River are sometimes referred to as being part of the Rocky Mountains but this is an unofficial designation). The western edge of the Rockies includes ranges such as the Wasatch near Salt Lake City and the Bitterroots along the Idaho-Montana border. The Great Basin and Columbia River Plateau separate these sub-ranges from distinct ranges further to the west, most prominent among which are the Sierra Nevada, Cascade Range and Coast Mountains. The Rockies do not extend into the Yukon or Alaska, or into central British Columbia, where the Rocky Mountain System (but not the Rocky Mountains) includes the Columbia Mountains, the southward extension of which is considered part of the Rockies in the United States. The Rocky Mountain System within the United States is a United States physiographic region; the Rocky Mountain System is known in Canada as the Eastern System. 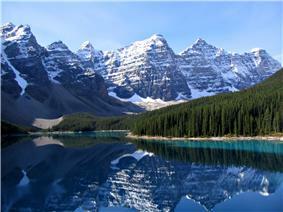 The Rocky Mountains are notable for containing the highest peaks in central North America. The range's highest peak is Mount Elbert located in Colorado at 14,440 feet (4,401 m) above sea level. 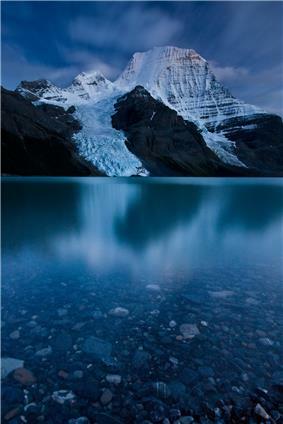 Mount Robson in British Columbia, at 12,972 feet (3,954 m), is the highest peak in the Canadian Rockies. The Continental Divide of the Americas is located in the Rocky Mountains and designates the line at which waters flow either to the Atlantic or Pacific Oceans. Triple Divide Peak (8,020 feet (2,440 m)) in Glacier National Park is so named because water that falls on the mountain reaches not only the Atlantic and Pacific, but Hudson Bay as well. Farther north in Alberta, the Athabasca and other rivers feed the basin of the Mackenzie River, which has its outlet on the Beaufort Sea of the Arctic Ocean. See Rivers of the Rocky Mountains for a list of rivers. Human population is not very dense in the Rocky Mountains, with an average of four people per square kilometer and few cities with over 50,000 people. However, the human population grew rapidly in the Rocky Mountain states between 1950 and 1990. The 40-year statewide increases in population range from 35% in Montana to about 150% in Utah and Colorado. The populations of several mountain towns and communities have doubled in the last 40 years. 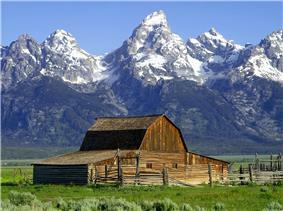 Jackson Hole, Wyoming, increased 260%, from 1,244 to 4,472 residents, in 40 years. In the southern Rocky Mountains, near present-day Colorado, these ancestral rocks were disturbed by mountain building approximately 300 Ma, during the Pennsylvanian. This mountain building produced the Ancestral Rocky Mountains. They consisted largely of Precambrian metamorphic rock forced upward through layers of the limestone laid down in the shallow sea. 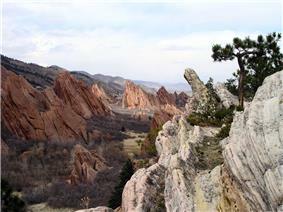 The mountains eroded throughout the late Paleozoic and early Mesozoic, leaving extensive deposits of sedimentary rock. Terranes started to collide with the western edge of North America in the Mississippian (approximately 350 million years ago), causing the Antler orogeny. For 270 million years, the effects of plate collisions were focused very near the edge of the North American plate boundary, far to the west of the Rocky Mountain region. It was not until 80 Ma that these effects began to reach the Rockies. The current Rocky Mountains were raised in the Laramide orogeny from between 80 to 55 Ma. For the Canadian Rockies, the mountain building is analogous to a rug being pushed on a hardwood floor: the rug bunches up and forms wrinkles (mountains). In Canada, the terranes and subduction are the foot pushing the rug, the ancestral rocks are the rug, and the Canadian Shield in the middle of the continent is the hardwood floor. Further south, the growth of the Rocky Mountains in the United States was probably caused by an unusual subduction, where the Farallon plate dove at a shallow angle below the North American plate. This low angle moved the focus of melting and mountain building much farther inland than the normal 200 to 300 miles (300 to 500 km). It is postulated that the shallow angle of the subducting plate greatly increased the friction and other interactions with the thick continental mass above it. Tremendous thrusts piled sheets of crust on top of each other, building the extraordinarily broad, high Rocky Mountain range. The current southern Rockies were forced upwards through the layers of Pennsylvanian and Permian sedimentary remnants of the Ancestral Rocky Mountains. Such sedimentary remnants were often tilted at steep angles along the flanks of the modern range; they are now visible in many places throughout the Rockies, and are prominently shown along the Dakota Hogback, an early Cretaceous sandstone formation that runs along the eastern flank of the modern Rockies. Immediately after the Laramide orogeny, the Rockies were like Tibet: a high plateau, probably 6,000 metres (20,000 ft) above sea level. In the last 60 million years, erosion stripped away the high rocks, revealing the ancestral rocks beneath, and forming the current landscape of the Rockies. Periods of glaciation occurred from the Pleistocene Epoch (1.8 million - 70,000 years ago) to the Holocene Epoch (fewer than 11,000 years ago). These ice ages left their mark on the Rockies, forming extensive glacial landforms, such as U-shaped valleys and cirques. Recent glacial episodes included the Bull Lake Glaciation that began about 150,000 years ago and the Pinedale Glaciation that probably remained at full glaciation until 15,000-20,000 years ago. 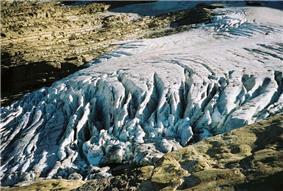 All of the geological processes, above, have left a complex set of rocks exposed at the surface. For example, volcanic rock from the Paleogene and Neogene periods (66 million - 2.6 million years ago) occurs in the San Juan Mountains and in other areas. Millennia of severe erosion in the Wyoming Basin transformed intermountain basins into a relatively flat terrain. The Tetons and other north-central ranges contain folded and faulted rocks of Paleozoic and Mesozoic age draped above cores of Proterozoic and Archean igneous and metamorphic rocks ranging in age from 1.2 billion (e.g., Tetons) to more than 3.3 billion years (Beartooth Mountains). 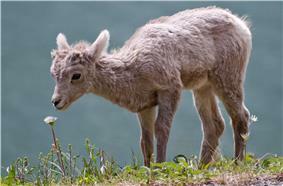 There are a wide range of environmental factors in the Rocky Mountains. The Rockies range in latitude between the Liard River in British Columbia (at 59° N) and the Rio Grande in New Mexico (at 35° N). Prairie occurs at or below 1,800 feet (550 m), while the highest peak in the range is Mount Elbert at 14,440 feet (4,400 m). Precipitation ranges from 10 inches (250 mm) per year in the southern valleys to 60 inches (1,500 mm) per year locally in the northern peaks. Average January temperatures can range from 20 °F (−7 °C) in Prince George, British Columbia, to 43 °F (6 °C) in Trinidad, Colorado. Therefore, there is not a single monolithic ecosystem for the entire Rocky Mountain Range. 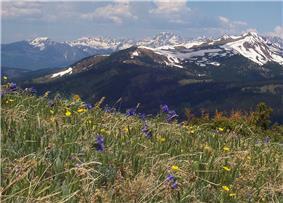 Instead, ecologists divide the Rocky Mountain into a number of biotic zones. Each zone is defined by whether it can support trees, and the presence of one or more indicator species. Two zones that do not support trees are the Plains and the Alpine tundra. The Great Plains lie to the east of the Rockies, and is characterized by prairie grasses (below roughly 1,800 feet (550 m)). 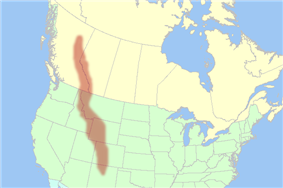 Alpine tundra occurs in regions above the treeline for the Rocky Mountains, which varies from 12,000 feet (3,700 m) in New Mexico to 2,500 feet (760 m) at the northern end of the Rocky Mountains (near the Yukon). The USGS defines ten forested zones in the Rocky Mountains. Zones in more southern, warmer, or drier areas are defined by the presence of pinyon pines/junipers, ponderosa pines, or oaks mixed with pines. In more northern, colder, or wetter areas, zones are defined by Douglas-firs, Cascadian species (such as western hemlock), lodgepole pines/quaking aspens, or firs mixed with spruce. Near treeline, zones can consist of white pines (such as whitebark pine or bristlecone pine); or a mixture of white pine, fir, and spruce that appear as shrub-like krummholz. Finally, rivers and canyons can create a unique forest zone in more arid parts of the mountain range. Since the last great ice age, the Rocky Mountains were home first to indigenous peoples including the Apache, Arapaho, Bannock, Blackfoot, Cheyenne, Crow Nation, Flathead, Shoshone, Sioux, Ute, Kutenai (Ktunaxa in Canada), Sekani, Dunne-za, and others. Paleo-Indians hunted the now-extinct mammoth and ancient bison (an animal 20% larger than modern bison) in the foothills and valleys of the mountains. Like the modern tribes that followed them, Paleo-Indians probably migrated to the plains in fall and winter for bison and to the mountains in spring and summer for fish, deer, elk, roots, and berries. In Colorado, along the crest of the Continental Divide, rock walls that Native Americans built for driving game date back 5,400–5,800 years. A growing body of scientific evidence indicates that indigenous people had significant effects on mammal populations by hunting and on vegetation patterns through deliberate burning. 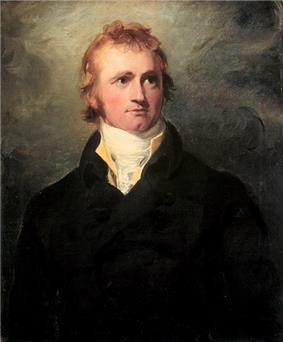 Sir Alexander MacKenzie (1764–March 11, 1820) became the first European to cross the Rocky Mountains in 1793. He found the upper reaches of the Fraser River and reached the Pacific coast of what is now Canada on July 20 of that year, completing the first recorded transcontinental crossing of North America north of Mexico. He arrived at Bella Coola, British Columbia, where he first reached saltwater at South Bentinck Arm, an inlet of the Pacific Ocean. Negotiations between the United Kingdom and the United States over the next few decades failed to settle upon a compromise boundary and the Oregon Dispute became important in geopolitical diplomacy between the British Empire and the new American Republic. In 1841 James Sinclair, Chief Factor of the Hudson's Bay Company, guided some 200 settlers from the Red River Colony west to bolster settlement around Fort Vancouver in an attempt to retain the Columbia District for Britain. The party crossed the Rockies into the Columbia Valley, a region of the Rocky Mountain Trench near present-day Radium Hot Springs, British Columbia, then traveled south. Despite such efforts, in 1846, Britain ceded all claim to Columbia District lands south of the 49th parallel to the United States; as resolution to the Oregon boundary dispute by the Oregon Treaty. 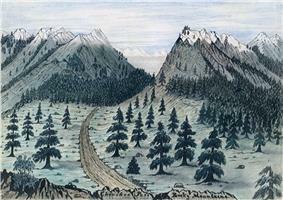 Cherokee Trail near Fort Collins, Colorado, from a sketch taken 7 June 1859. Thousands passed through the Rocky Mountains on the Oregon Trail beginning in the 1840s. The Mormons began to settle near the Great Salt Lake in 1847. From 1859 to 1864, gold was discovered in Colorado, Idaho, Montana, and British Columbia, sparking several gold rushes bringing thousands of prospectors and miners to explore every mountain and canyon and to create the Rocky Mountains' first major industry. The Idaho gold rush alone produced more gold than the California and Alaska gold rushes combined and was important in the financing of the Union Army during the American Civil War. The transcontinental railroad was completed in 1869, and Yellowstone National Park was established as the world's first national park in 1872. Meanwhile, a transcontinental railroad in Canada was originally promised in 1871. Though political complications pushed its completion to 1885, the Canadian Pacific Railway eventually followed the Kicking Horse and Rogers Passes to the Pacific Ocean. Canadian railway officials also convinced Parliament to set aside vast areas of the Canadian Rockies as Jasper, Banff, Yoho, and Waterton Lakes National Parks, laying the foundation for a tourism industry which thrives to this day. 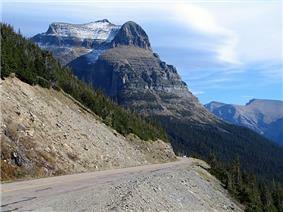 Glacier National Park (MT) was established with a similar relationship to tourism promotions by the Great Northern Railway. While settlers filled the valleys and mining towns, conservation and preservation ethics began to take hold. U.S. President Harrison established several forest reserves in the Rocky Mountains in 1891–92. In 1905, U.S. President Theodore Roosevelt extended the Medicine Bow Forest Reserve to include the area now managed as Rocky Mountain National Park. Economic development began to center on mining, forestry, agriculture, and recreation, as well as on the service industries that support them. Tents and camps became ranches and farms, forts and train stations became towns, and some towns became cities. The Rocky Mountains contain several sedimentary basins that are rich in coalbed methane. Coalbed methane is natural gas that arises from coal, either through bacterial action, or through exposure to high temperature. 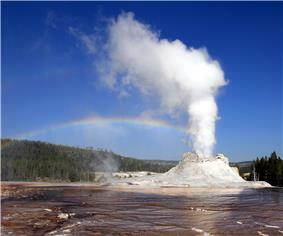 Coalbed methane supplies 7 percent of the natural gas used in the United States. 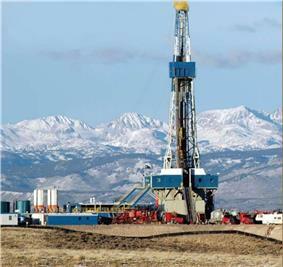 The largest coalbed methane sources in the Rocky Mountains are in the San Juan Basin in New Mexico and Colorado and the Powder River Basin in Wyoming. These two basins are estimated to contain 38 trillion cubic feet of gas. Coalbed methane can be recovered by dewatering the coal bed, and separating the gas from the water; or injecting water to fracture the coal to release the gas (so-called hydraulic fracturing). Every year the scenic areas and recreational opportunities of the Rocky Mountains draw millions of tourists. The main language of the Rocky Mountains is English. But there are also linguistic pockets of Spanish and indigenous languages. French is another official language in Canada's national parks. In the winter, skiing is the main attraction. A list of the major ski resorts can be found at List of U.S. Rocky Mountain ski resorts. Needles of larches in Alberta turn yellow in autumn.